I have only a few weird photos to share of what’s going on around here. This is the second “Quilt for Boston” that I free-motion quilted (I’ll share a better photo of the quilting soon–I’m not *proud* of it, but I’m OK enough with it not to rip it all out. Positivity! Confidence! I exude it!). And, my toddler’s laundry. 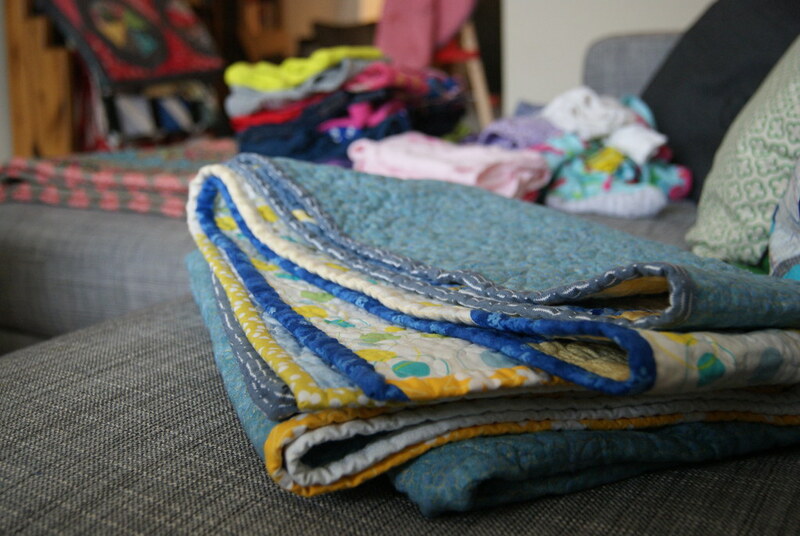 I’m up to ten Liberty x-plus blocks. I am DYING to make clothes from several of these prints. Conveniently, I started making clothes in earnest AFTER this line is pretty much already gone from the shops. And speaking of making clothes, I’m bitten. 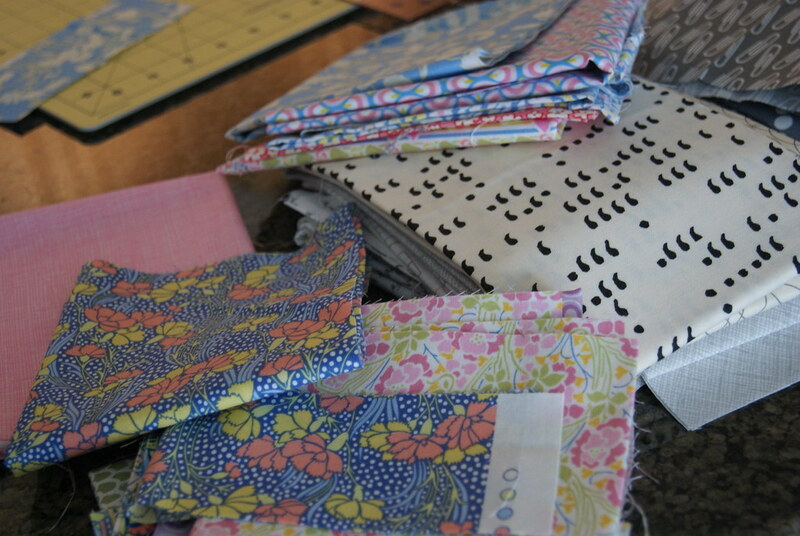 I finally received the Tsuru Motif Madness yardage I’ve only wanted since, oh, February. 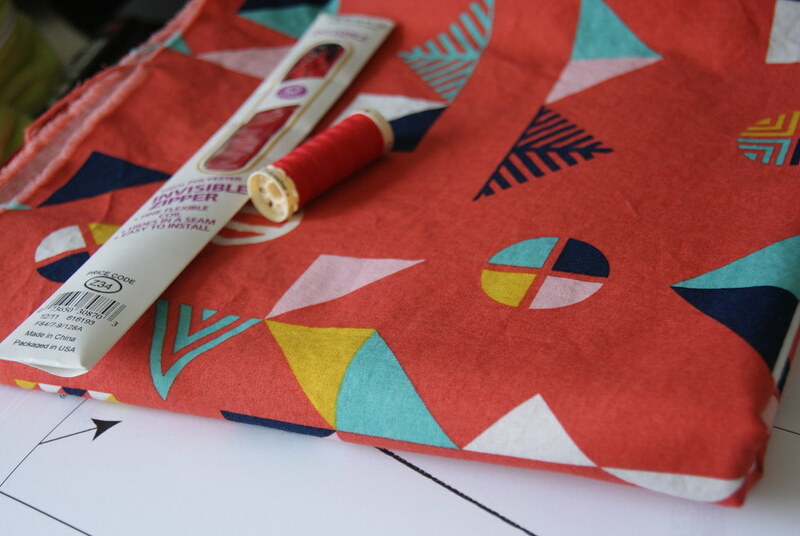 (I’m the worst about piddling around about buying fabric–do I really want it? which color? what for? blah blah and this sold out immediately, and I had to wait for it to re-ship. When Koi comes out I’m on it like a duck on a junebug.) I had wanted to make this skirt, but asked around about favorite skirt patterns on Facebook. Immediately Samantha (founder of the forthcoming A Gathering of Stitches in Portland, ME) responded that she’s made a bunch of Colette Ginger skirts. And, well. Who can resist that high waistband? A printing mishap kept me from getting this sewn up in time to pack into my suitcase–but as soon as we get back from the beach, I’m on it. 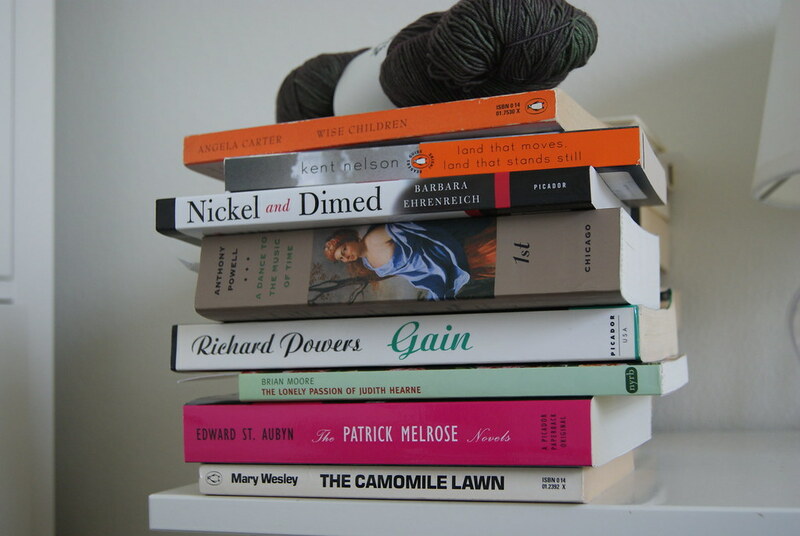 I’m taking all of this with me to the beach so I can have books to read and socks to knit while I’m chasing my toddler ah hahahahahaha. Catch you in July! X-pluses, Ginger skirt, a post about that Lizzy House Washi that I Instagrammed twice, a better photo of that Boston quilt…all here. I have a hard time stopping to take pictures in the middle of projects too! Also, Can’t wait to see your Liberty x plus blocks!! I’m actually working on one with my leftover Carnaby Street fabrics. I thought the x plus looked kind of like a Union Jack, so thought it would be a great match for the fabrics. Your Liberty prints will look awesome in that too! You certainly have a lot of projects going on 🙂 and a lot of books to read at the beach. We are going to the beach too in July and I will be taking my sewing machine – I can’t help it. I hope you have a great time, and some chance to relax. Sounds like you once again have ALOT going on. Hope you have fun at the beach! I love that Tsuru print too. Have a great holiday. Sounds like you have a lot to look forward to when you get back too! That’s lots of books and lots of stuff going on. I hope you have fun at the beach and don’t overplan your vacay. Ooh, I love that skirt pattern! I can’t wait to see yours! One of these days I AM going to make the leap into sewing garments. better go grab some more stile!